After many requests from customers over the last few months, we are going to dedicate the net few Senior Design Team Challenges to revisiting older stamp sets. Therefore breathing new life into them and inspiring you to dust them off and use them in new & fun ways. This month I challenged them to focus on Spiral Bouquet. Spiral Bouquet was released during the first year we were in business and I can remember it like it was just yesterday. I put a lot of time & effort into this collection of images and I still love it just as much to this day. There are many layering possibilities with this set. The line images can be layered on top of the shadows. Or you can of course use them separately, as you will see below with all of the team projects. Didn't the team do an AMAZING job revisiting this set? It brought me such an incredible amount of joy to see all of these projects come together! 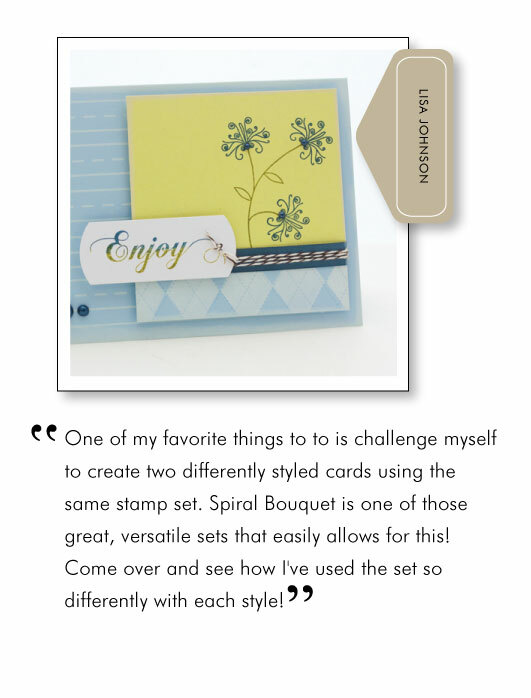 Do you already own Spiral Bouquet? Have you created anything fabulous with it that you would like to share a link to in the comments section of this post? I would love to see it! I hope you have been as inspired as I was and get the opportunity to create something fabulous! Thanks for stopping by today! What a fabulous idea! Thanks so much, I enjoyed seeing these creations and will look forward to more ‘breathing new life’ into old stamp sets. Thank you so much Nicole for doing this. I have this set and needed some fresh ideas. Thanks again – all the cards are so beautiful! I love to pull outs some of my older PTI sets and experiment with the new colors, buttons and felt. Really fun! Thanks to the Design Team for sharing! Yay for revisiting older sets! Love this one so much. 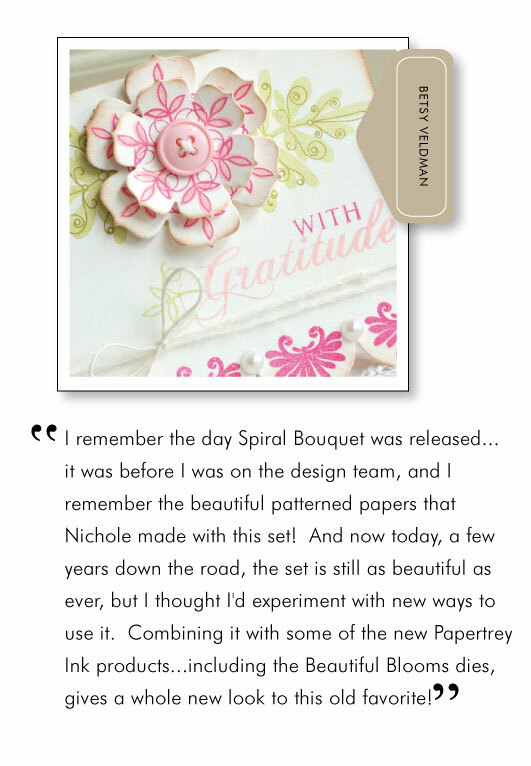 Have I really been following Nichole’s blog since way back at Spiral Bouquet? Guess time flies when your are having fun! As I wasn’t aware of PTI when you first released your stamps (didn’t even stamp when it comes to that) this set is completely new to me. But it’s a beautiful set and what I’ve seen from the design team very versatile. me once again with their outstanding creations. Now I have still another set to add to my wish list. This is such a great idea…while I have explored and purchased many of the older sets, seeing them in use by the DT brings it to a whole other level and brings to light a set I may have overlooked. Fantastic idea!! Oh I LOVE this set and still use it A LOT! Thanks for challenging the DT to use Spiral Bouquet. Here’s a card I made earlier this year. 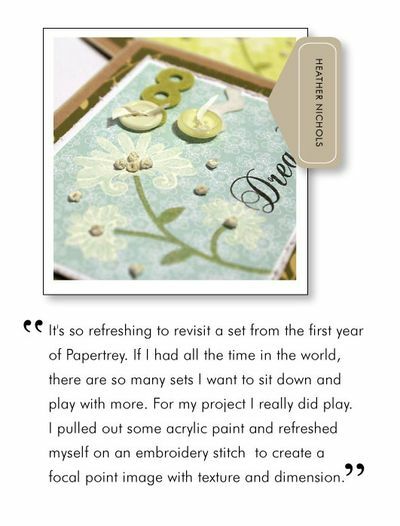 I had thought about sending an e-mail asking if you would consider revisiting older sets — thanks for being mind-readers as well as fabulous crafters!! Yet another set to add to my ever-lengthening wish list! 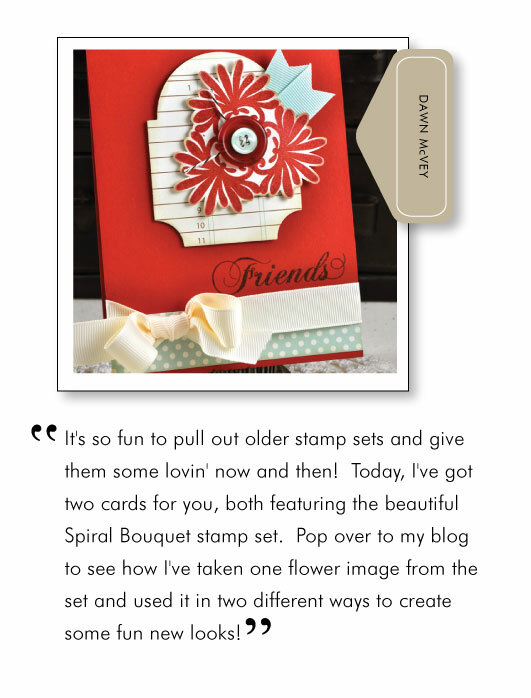 I just wanted to say THANK YOU for revisiting an older stamp set Nichole! Being fairly new to PTI, I wasn’t even aware this set existed, but I must say I LOVE it and will be adding it to my “wish” list. The DT did an amazing job of showcasing it too. I was very impressed with the creative spin each designer put to these beautiful stamps! Me Too! As a relative newcomer, this was one of the first sets I fell in love with PTI b/c of Spiral Bouquet. Thank for the inspiration! Thank you! Seeing the design team magic on “vintage” sets (as Heather said) with products that have debuted since then is so rewarding. It’s like bringing them to life all over again and is very, very appreciated! Thanks for bringing this set back and letting us see some fresh ideas with it! Revisiting old sets is a great idea and this one is still on my wish list – that list that just keeps growing ever-longer! Fabulous idea again Nichole. I had never explored this stamp set and it has so many possibilities. Great job ladies. 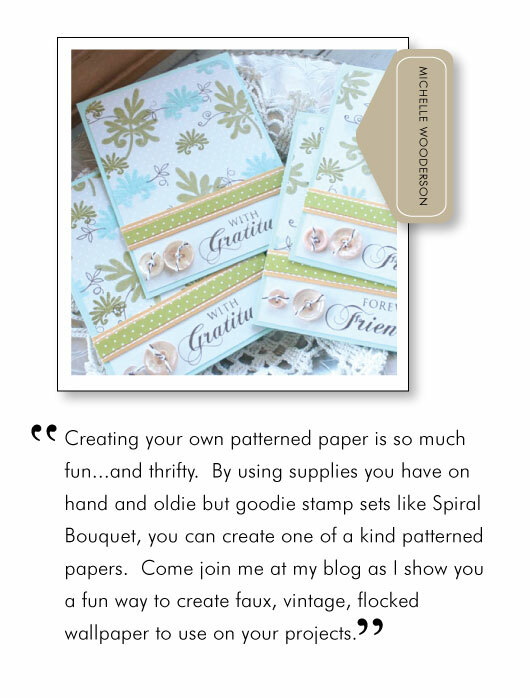 I LOVE the idea of doing revisited type posts! It’s so fun and it’s great to make us pull out those sets we haven’t used in awhile (or get new to us, but totally classic stamp sets!) Thanks for the fabbie inspiration and thanks for being so sweet at CHA! I can only imagine how tired you must have been at the end of the day! THANK YOU! Please continue to do more revisited posts like this. I have a handful of old favorite PTI stamps and love the newer inspiration. Beautiful work…can’t wait to see more! Oh my.. that pink flower/button is amazing! Love these images! Beautiful samples! I really enjoyed seeing what you guys did with this set!!! I was never wild about it, untill I saw you all use it! But that is what you guys do to me….I see it, not crazy about it, you and the designers use it, and I have to have it!!!! LOL!